Crime prevention through environmental design, or CPTED, is a multidisciplinary strategy to deter criminal behavior through environmental and architectural design. CPTED first caught the public eye in the early 1970s, but its fundamental principles have influenced architects, designers, civil engineers and security planners for thousands of years. CPTED concepts influenced designers of the Great Wall of China, the palace of Versailles and the ancient city of Alexandria. Designers of castles, forts, cities and fortresses throughout history have incorporated the natural environment and architectural creativity to improve security. These principles became the basis of modern CPTED doctrine, which now guides consultants and designers around the world in creating safer cities and buildings. CPTED strategies combine natural environments, building features, space planning and human psychology to influence personal decisions that precede criminal acts. These strategies manifest themselves in a variety of design features such as landscaping elements, water features, pedestrian traffic flows and lighting, just to name a few. In most cases, implementation costs less than traditional approaches where security often becomes an afterthought for architectural planners. Open areas allow people to see and be seen, which helps deter crime. • Natural surveillance refers to the placement of physical features such as trees, lighting, building elements and space layout to maximize visibility. 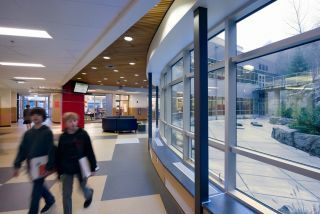 For example, when designing a school project, planners should locate windows to expand visibility throughout the facility. Vegetation should not be located where it could keep students and staff from having clear visibility of interior and exterior spaces. Conversely, systematic use of natural surveillance passively informs would-be perpetrators that their activities are openly visible: If you can see, then you can be seen. • Access management creates an organized flow of people throughout a campus and campus facilities. Through easy-to-understand signage, well-marked entrances and exits, space-defining landscapes and flow-defining architecture, occupants can easily recognize and predict acceptable behaviors. While improving usability for occupants, this approach makes unacceptable behaviors more obvious, more uncomfortable to initiate and easier to detect. • Territoriality clearly delineates spaces, expresses pride and ownership, and creates a recognizable and welcoming environment. For example, a large sign celebrating the entrance to the school, celebrating accomplishments and declaring pride of ownership creates a strong sense of territory and ownership, and inherently discourages acts such as vandalism. • Physical maintenance, including repair and general upkeep of facilities and campuses, preserves clear visibility throughout campuses and perpetuates the message of ownership. Quickly removing graffiti, maintaining clean and operable campus services (such as restrooms, light fixtures and stairways) enhances comfort for occupants and public safety. • Order maintenance emphasizes appropriate and consistent responses to minor unacceptable acts while providing clear requirements for acceptable behavior. This particularly applies to daily management of student behavior as well as campus visitors. While not specific components of CPTED core design principles, two very important supplemental considerations are activity-support planning and placement, and target hardening. Activity-support planning and placement creates efficient and logical adjacencies between one facility program area and another. For example, thoughtfully locating a faculty lounge area can allow teachers and staff to naturally observe a parking lot or playground area, further minimizing the potential for crime in those locations. Target hardening simply means constructing or equipping a building to become more difficult to forcibly enter. Common methods for hardening targets include door locks, alarms, surveillance cameras and vehicular gates. Hardening facilities is a significant undertaking and can create unintended negative impacts such as inconvenience, a perception that an area is unsafe, and fear among users, which is as detrimental as some potential risks. As the topic of school security grows increasingly sensitive for our country, it is common to hear public demand for more cameras, access control, fences and other instruments of security. Purchasing solutions is a natural reaction, but unfortunately historical evidence demonstrating how more technology reduces crime rates cannot be found. Vast sums of money have been spent on security solutions with little or no evidence that motivated offenders are being deterred. In one study, a 10-foot fence with barbed wire took less than 10 seconds to penetrate. The same fence caused students and surrounding communities to feel less safe. Rather than randomly adding security features and technologies, CPTED approaches security with holistic purpose. While CPTED is not a replacement for target hardening, staff training or policy and procedures, it is a promising and cost-effective prevention strategy that gives schools a starting point when planning their security strategies. CPTED implementations can often lead to immediate reductions in crime and social unrest in school environments with minor capital expense. These techniques create environments that encourage more positive social interaction, reduce fear among students and teachers, and lead to safer school experiences. Scott McChesney is an senior security systems designer for Sparling. Nathan Larmore is a principal and practice leader for technology services for Sparling.